Akshay Kumar's Toilet Ek Prem Katha is set to release in China on June 8 in over 11,500 screens, which means the film will have more than 56,000 shows daily at the box office. 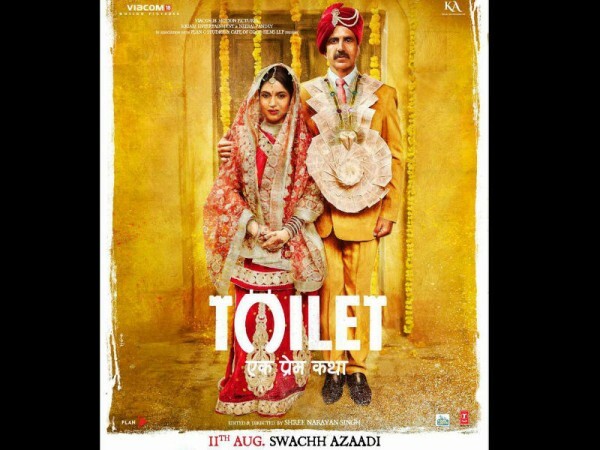 Akshay Kumar's Toilet Ek Prem Katha is all set to release in China on June 8 but even before that, the film has shattered the records of Salman Khan's Bajrangi Bhaijaan. Bajrangi Bhaijaan, directed by Kabir Khan, was released in China across 8,000+ screens on March 2. However, Toilet Ek Prem Katha has shattered that screen count number by a huge margin. Akshay's film, which became a blockbuster hit in India, will release in China in around 11,500 screens that mean the film will have more than 56,000 shows daily and it might go to 58,000 shows. In fact, the screen count is higher than Irrfan Khan's Hindi Medium as well. "#Xclusiv: 11,500 screens... 56,000 shows every day [may go up to 58,000 shows]... #ToiletEkPremKatha opens in China today [8 June 2018]... Much larger release than #HindiMedium and #BajrangiBhaijaan in China...Titled #ToiletHero for the local audiences," trade analyst Taran Adarsh tweeted. Earlier, Akshay had tweeted saying that the film will release in China in across 4,300 screens, but according to the trade expert, the screen count is much higher than initially reported. But will the higher screen count result in a good box office collection? Well, it depends how the audience receives the film. The previous Bollywood releases, including Aamir Khan's Dangal and Secret Superstar, created havoc at the Chinese box office. Aamir's Dangal, which was released in China last year, earned more than Rs 1,227 crore, which took its worldwide box office collection to Rs 1,979.12 crore. Meanwhile, Toilet Ek Prem Katha is Akshay's first film to release in China. The film which focuses on the issue of open-defecation and how it affects millions of lives opened in India with a positive response on August 11, 2017. Directed by Shree Narayan Singh, the film features Akshay and Bhumi Pednekar in the lead roles and Anupam Kher, Divyendu Sharma and Sudhir Pandey in supporting cast.